I discovered later that Manoumalia was created by perfumer Sandrine Videault who lived on the island of Wallis in the South Pacific. Her heady blend of frangipani, ylang-ylang and amber was her tribute to the island—to the scents of women’s perfumed skin, their flower garlands and beauty preparations. I’ve never been to Polynesia, but I’m familiar with the smells of Indian tropics, where the odors of human existence underpin the blooming tropical exuberance. The sun may be generous and lavish, but it also means decay and death, which is what you can smell in the delicate freshness of jasmine blossoms and taste in the sugary richness of mangoes. I could never imagine finding this experience in a perfume bottle, and even when I discovered it through Manoumalia, I wasn’t convinced I could pull it off. Taken out of its tropical context, Manoumalia was a shock, but eventually it became the fragrance to which I turned to forget the winter, the grey skies and the routine of my weekdays. I usually put a drop on my wrist after my evening bath and curl up in bed with a book. As I turn the pages, the perfume blooms on my skin and invariably distracts me from my reading. At first, Manoumalia teases me with heady white flowers which combine creamy frangipani and ylang ylang with the fruity sweetness of jasmine. The pungent warmth—is it someone’s sun warmed skin, or perhaps, the rotting papaya peels?—appears stealthily and suddenly I don’t just smell the tropics; I feel their balmy warmth around me. Manoumalia is a complex fragrance, and it takes time for it to develop. Along the way it stops by the temples where the smells of wilting marigold garlands are joined by the smoky perfume of sandalwood incense. Manoumalia’s hints of cumin and nutmeg take you into the street stalls where women blend spices for fiery chutneys. The darkness of amber and woods lands you in the bridal chamber, where the blushing bride in red silks is being anointed with turmeric and sandalwood paste. Manoumalia finishes its story on an opulent musk, which would have been creamy and tender, if it weren’t for its dense chocolate-like bitterness. Is it a stunning perfume? Yes, without any doubt. But it’s challenging to wear, it lasts for ages and takes over the whole room with its rich, heavy trail. I don’t approach Manoumalia unless I’m prepared for its whirlwind journey. I hardly ever wear it in public, preferring to save it for moments of solitude. It’s a dazzling sensory ride, but it can easily become overwhelming. For those who like their florals raunchy and naughty, however, it’s a must try. 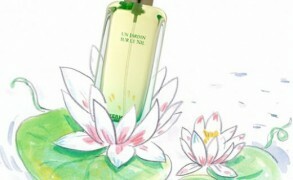 Les Nez Manoumalia includes notes of fragrea (tropical flower), vetiver, tiare, ylang ylang, amber, and sandalwood. Available directly from lesnez.com as well as Luckyscent. Image: Flower garlands (white jasmine and orange kanakambaram) by mckaysavage, via flickr.com, some rights reserved. 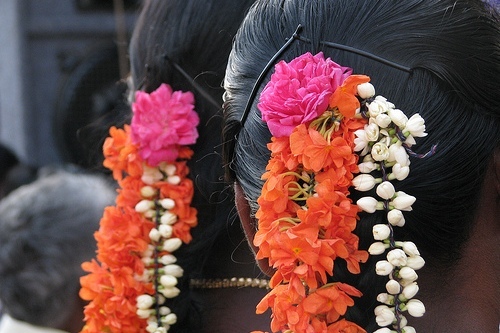 Women in South India wear such lovely garlands in their hair on daily basis, a wonderful custom. I’ve recently seen a documentary about Manoumalia (not yet distributed). During a sequence, Sandrine Videault has Wallisian women test it — both the ladies who taught her traditional Wallisian blends and other women in a market. It’s amazing to see the grin on their faces! I’ve also had a very surprising experience with it during one of my London perfume appreciation courses. One of the people there was a 60 year-old biochemist from South India. He had tears in his eyes when he smelled Manoumalia: he said he’d been looking for such a perfume all his life. I can’t believe that I’ve missed this review by March! I completely understand what she’s talking about. There is something very disconcerting about this perfume, but it’s also the same feeling that I’ve experienced when I went to India for the first time. When I walked out of the airport building in Delhi and stepped into the hot, humid evening air, for a second I wanted to run back to the air conditioned, relatively scent free comfort of the terminal. The smell was like a material presence–something burning, human odors, mango peels, night blooming flowers that had such a narcotic, heady scent I felt dizzy. Whenever I return I still brace myself for the first moment I meet the “smell”. Over time it becomes an integral part of my experience, and I start to miss it when I come back. Ah, Manoumalia isn’t a perfume I wear to smell good, that’s for sure. It’s really an experience, and I applaud Les Nez and Videault for having guts to make it. grain de musc: I don’t think the documentary has been sold to any channel yet. I imagine it’ll be on one of the stations dedicated to French overseas territories, or perhaps on France 5. I saw a preview copy. Victoria: Oh, good, I would love to see it. There aren’t too many scent related documentaries, although Robin just posted about a perfume reality show! Jenna: The perfume sounds strange but you’ve made me curious enough to order a sample from Luckyscent. Victoria: 🙂 In India, everyone wears them, from school girls on their way to school to elderly women cooking the street food. I remember seeing a woman who was helping at the road construction site by carrying baskets filled with bricks and soil on her head–a hard and dirty work. She was wearing a bright pink sari and a string of jasmine in her hair. Nomatter what our situation is, women want to be beautiful, and it was a touching reminder. Victoria: Don’t be disappointed! It would be so dull if all of us loved the same thing, and we would be broke if we loved everything that came our way. Victoria: LOL! This reminds me how I used to wear Tresor thinking that it was a light fragrance. Can you think of another sillage monster comparable to Tresor? It takes over the whole room. Victoria: Mmm, I agree–that smell of ripeness is something that is definitely very polarizing. My husband hates this perfume, although he puts it very diplomatically, “it’s very strong.” But by the look on his face, I can see that he isn’t a fan. I know him well. solmarea: Adore the description. Journey through scent of a land, colours & story richness. Victoria: Are there any special local brands in Hawai’i? I’m so curious about the perfumes you bought there. Austenfan: Manoumalia to me was love at second sniff. I only have a sample that I have nearly drained, and am saving for a bottle. I find it unusual, but not at all strong or repellent. ( I have actually worn it to work.) What I love about it that it is tropical without being sweet. At least it isn’t to me. Austenfan: No, no one commented. Mind you, I don’t think that would be likely where I live. Although whenever I have worn Rien ( only one small spray at the base of my neck) people have commented. I don’t find Manoumalia that strong. I had to reapply after maybe 3-4 hours because I could no longer smell it. Victoria: I’m also glad that it isn’t conventionally pretty. There are so many of such fragrances out there, but there are so few that truly explore the dirty, raunchy notes. For those, you have to explore the classics, which certainly don’t shy away from animalic effects. 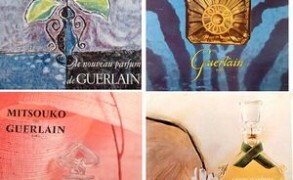 Guerlain Shalimar may seem so prim & proper with its venerable history and established pedigree, but it’s such a bombshell! Austenfan: Actually the comments on Rien were positive. The best one was that it smelled unusual and that it suited me. Victoria: Sometimes you need perfumes to wear only for yourself. 🙂 I now think of Manoumalia as my fantasy, escapist perfume. It’s my olfactory Bollywood equivalent! JulienFromDijon: I wanted to stock one bottle of it. I did (ebay auction, noch such a bargain though). I remembered “manoumalia” as stronger. I still have to check with my old sample, if a twist occured.